Channel the excitement and enthusiasm about the World Cup into playing! 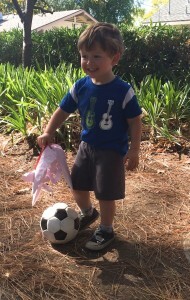 Get out and kick around the soccer ball on the sidewalk, street or park. Practice every move you see. Try to pass the ball with the inside of your foot and the top of your laces like in real soccer. Pass it back and forth with your knees or head. The point is to spend as long as possible playing. Make it a game. Bring out the neighbors and have them be defense or goalie. Practice fancy moves like the bicycle kick or behind the back cut. There are so many fun soccer moves to try! Set up shoes or cones and weave the soccer ball in and around the cones like official soccer practice. Don’t be a soccer parent standing at the sidelines watching. Get in there and PLAY! Your kid will be happy he/she is faster than you, and you’ll be happy you are all moving. If you have older kids, each can pretend to be a country playing against each other. Take it seriously, and slide into the ball. Yell “gooooooal” in whatever language your ” country” speaks. If you have space where you are watching the game, stand up and dribble the ball side to side. Kick it back and forth between commercials. Be a soccer player, if only for a few weeks. Chances are you and your kid(s) will want to continue long after the World Cup is over. 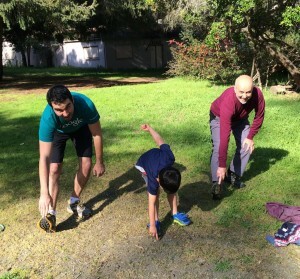 Three generations exercising together! Happy Father’s Day! The most common reason people give for not exercising is lack of time. As a parent of two children who works inside and outside the home, I understand. Some of the people I admire most are athletes who have to go above and beyond to exercise. 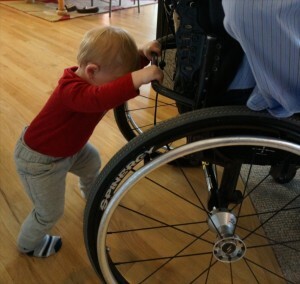 Yes, they have to prioritize their time, but they also have to put on a prosthetic, change wheelchairs, and demonstrate amazing drive to bring fitness into their lives. One organization I really admire is the Challenged Athletes Foundation. For 20 years, they have helped people of all ages, wounded soldiers and “individuals with physical challenges who desire a balanced life of work, family, friends and fitness.” They partner athletes with a mentor who has similar challenges, so confidence and skill is passed on. They are an outstanding organization that truly partners fitness with family and friends and changes lives. If you want a goal this summer, train for one of CAF’s many fundraising events. Next time you are wondering if you have time to work out, feel like it’s too hot/cold, are tired, or fill-in-the-excuse here, think about the challenged athletes who go for it. Whether they compete in Ironmans (notice the range of ages in the pictures) dance, go for a bike ride, snowboard (watch this one!) or compete in the Paralympic Games (there are 28 competitive sports from rowing to wheelchair fencing! ), be inspired, be moved — figuratively and literally. If you want more inspiration, some other great organizations for adaptive athletes are Adaptive Action Sports, Extremity Games, and Disabled Sports USA, and Athletes with disAbilities Network.